How to Make An Easy Embroidery Hoop! Creating unique and personalized art for our babe's room was a something I so desired to do. I wanted the nursery to be vintage and feminine, but not too frilly, so creating embroidery hoops for her walls seemed like just the right touch. Creating the Hot Air Balloon Hoop in this tutorial, I fell in love all over again with this past time of mine from when I was a young girl and inspired several others (pictured below) for family and those very dear to my heart. If you would like to make one for yourself, I'd love to invite you to take a peek at the tutorial below! Decide what imagery you want for your hoop. I adore the whimsy of the hot air balloon so I chose that for one of our babe's hoops. I folded in half a piece of paper and drew along the folded edge what I thought a hot air balloon would look like (think the shape of a standard light bulb). I unfolded it and cut the insides into uneven balloon stripes and cut the bottom off to be my basket shape eventually. Decide what colors you fancy. My favorites are a bunch of mis-matched florals and contemporary designs -- a few vintage, a few modern, a few baby-like. Heres a little secret...to make it easy on yourself, use an iron-on product that will allow you to easily stitch your fabric onto your stretched hoop. (Something like this). Cut your piece of plastic iron on paper and place underneath your fabric, making sure all parts of fabric needed are lined up with plastic paper. You guessed it! Iron it on! 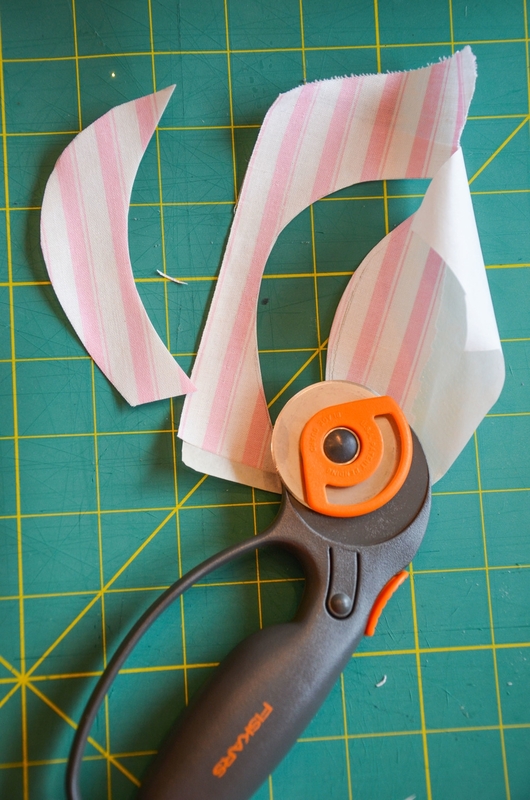 Remove excess fabric carefully with a rolling cutter to ensure a nice, clean edge. Lay out your pieces to see how they fit. I would encourage you to not cut all your fabrics until you are certain you like the composition and how the colors mesh. (Notice below the rest of the image at this point is my original template). Cut out any other other shapes. I wanted clouds for this one, and I was drawn to giving the clouds a flat edge as opposed to fluffy all the way around. Your call! Once you have all your pieces cut, lay them out once more to ensure you are happy with the color arrangement. Peel off the back of the iron on paper, and iron on all pieces to your fabric! Its not time to begin sewing! Pull the tapestry floss through the eye of the needle only a few inches and hold onto that loose tail as you sew. Don't forget to tie a knot at the other end! Choose the stitch that best suits you! You can google types of embroidery stitches here! Note: I did not add fabric to the clouds. I thought they looked best with a white outline since my fabric was already white. Finally, add whatever lettering you like! I pre-wrote mine with pencil and stitched over the top. Just a little sneak peek of our nursery and the fininshed hoop! Cannot wait to share our babe's finished nursery soon!!! !